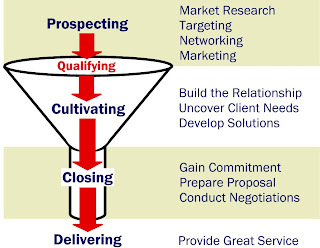 One of the most effective tools I've found for organizing a company's business development efforts is the Sales Funnel. At first glance, it simply looks like a cute way to illustrate the sales process. But keep in mind that each stage of the funnel represents a different set of activities--and a corresponding different set of needed skills. That's where I find it particularly helpful. Stage 1: Prospecting. These are the activities designed to generate and uncover sales leads. Stage 2: Cultivating. Once you've qualified the lead (meaning it's real and you're interested), another set of activities follows to gain the client's trust. Stage 3: Closing. These are the activities that help the client make a final decision and negotiate the terms of the agreement. Stage 4: Delivering. You may not think of this as part of the sales process. But in my mind it is because the client will continue to evaluate the purchase decision (and that obviously affects future sales). Plus, remember that you haven't delivered what the client bought until the project's done. How effective is your "sales force" in each stage of the sales process? Is your firm committing enough time to each stage? Do you have the right people in the right roles in each stage of the process? How effective? One of the basic realities of any kind of funnel is that what comes out the bottom depends on what you put in the top. The biggest problem for most firms is generating enough leads to adequately fill the funnel. Most technical professionals hate cold calls and "working the crowd" at networking events. But there are other, usually more effective, ways to generate leads. Networking among established relationships, including existing and past clients, is effective when you make this activity mutually beneficial (see Tim Klabunde's article "Rethink Networking"). You can also generate leads through effective marketing (see my previous post "Marketing for Leads"), although few firms have mastered this. Bottom line: You need to be reasonably effective at each stage of the funnel to be successful. Enough time? No matter how effective your sales strategy, you won't get far unless you commit enough time to it. Many firms attempt to develop new business with leftover time. That means their seller-doers don't spend much time selling as long as they're busy "doing." You know where that leads, especially when markets tighten. A better approach is to budget people's time for business development and manage those commitments just like you do on projects. In fact, I encourage tracking "sales utilization." Using one's allotted time doesn't necessarily mean it's time well spent, but that's still better than "waiting until I can find the time." Let me marry the first two questions to make an important point. When firms don't invest enough time above the funnel, they will often deceive themselves by chasing a lot of RFP opportunities that they have no real chance of winning. That's like cramming stuff in the funnel, trying to go straight from prospecting to closing without cultivating the client's trust. Not only does it rarely work, but it ties up valuable business development time that could be better spent elsewhere. Unfortunately, there are few shortcuts to sales success. Right roles? As you might expect, the most common complaint I hear is "We don't have enough people who are comfortable above the funnel." But that often presumes that the only people who can be effective above the funnel are aggressive extroverts. Consultant Ford Harding surveyed over 100 highly successful sellers of professional services and found that there wasn't one pervasive personality type, nor one approach that worked for all. The secret is to fit the right people to the right roles. Some may enjoy socializing with prospective clients. Others are better at getting valuable information from their existing contacts. Still others can contribute by writing articles or doing internet research. And some are simply more effective in other stages of the Sales Funnel. The Sales Funnel helps remind us that selling isn't nearly so monolithic an endeavor as many in our business think. There are many complementary roles and responsibilities, so that almost anyone equipped with effective strategies and a commitment of time can make a meaningful contribution to your business development efforts.